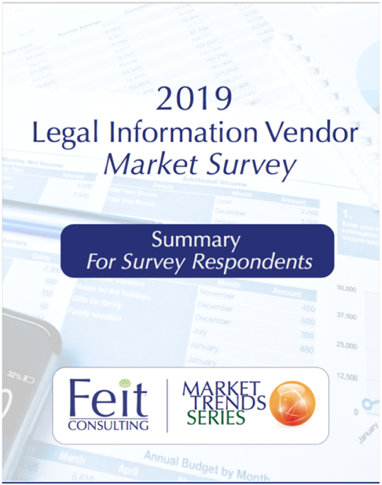 A big thank-you to all the law firm professionals throughout the country who participated in our semi-annual Legal Information Vendor Market Survey. The survey wrapped in December and we have been hard at work analyzing the results since. 75% Unimpressed with Edge. Three quarters of the respondents weren’t too excited by Westlaw Edge. In fact, 46% indicted that they will wait 12 months or more before they consider an Edge purchase, and 30% said they are unlikely to buy Edge, ever. Edge, gratis? Of the respondents who would take Edge, a third of the respondents stated they would not take it unless it is offered for free. BBNA: a strong link between a price hike and dissatisfaction. 65% of respondents are Extremely or Moderately Dissatisfied with BBNA. Again, that dissatisfaction rate is more than all the other vendors combined. Lexis Surprise: Indispensable products create leverage. Lexis has the most leverage of any vendor, with two products that respondents ranked as the most indispensable: Law360 and Intelligize. This is just a snapshot of the survey results. For the price of a new vendor lunch ($250) you can read the entire survey. And remember your copy of the survey is shareable with your entire firm. Get your copy here.